Connect every employee with the files, data, and experts they need — anywhere, anytime. For me, the best part of Chatter is being able to keep up with the industry. The deals, specials, and even current happenings of the market. We run a 34 casino/hotel industry and keeping up with multiple businesses in many states is easier with this tool. We have a central place to look at when comparing these categories. This tool works great, I only wish it was more new-age looking. I think it could be updated little by little to help older people with the transition and help younger people use it more. Also I think if we could make an option to flag feeds that are of high importance that could be useful as well. Thank you for the work done so far, as I say- we use this tool every day, multiple times daily. My recommendation for using Chatter is to start by following groups, people, and remember to check your notifications. Don't be afraid to ask questions and post on the feeds. If you don't ask or post, you will never get the answers you are looking for. Everyone in the Chatter community is very positive and understanding with newbies. I think who ever begins using this tool and sticks with it for a week will see the value it provides over multiple emails daily. We are able to reach out to coworkers and solve individual customer problems or business problems as a whole by using chatter feeds instead of multiple emails daily. That is what makes this tool so effective. Archiving the messages after so long but still making them searchable may be helpful as well so that we can find answers to questions that may have come up in the far past. I think that may be a setting I could be missing though. I like being able to communicate with employees about problems, guests, or situations that are going on without emaling multiple times daily. this is more of a messaging board and it is easy to use as long as you do not miss messages. I like that you can select groups and people to follow on the feeds. Sometimes it is easy to miss a chatter notification when you are receiving several per day or at a time. The tool is so easy to use but missing these can be just as easy which can sometimes be frustrating. If there was a way to prioritize from people or group them a certain way as to not miss them that would help a lot. Also some more visuals to make it look more engaging. Make this more interactive like a social networking site and it will be at it's best state. To get accustomed to using the chatter system instead of email chains is difficult at first, but it does get easier. I would suggest for first-time users to start with just a few chatter groups until they get the hang of managing them. We use this tool so much within our company and the best portion for us is the management announcement section that is constantly up-to-date. This could be emphasized a little more to show the importance and maybe appear at the top. "Good solution for people communication (non-instant) and repository for information"
The message's feed (chatter) has a good and clean visual, gathering all the relevant information I wan,t after selecting the groups and person to follow. The notification also works perfectly, since I can have a daily email with the most important messages sent in the last couple of days. The way the system organize the teams and people is also very good, easy to find people. Sometimes I see too many messages from people or groups which I am not following on the system. This makes my feed I little bit flooded, and I have already tried to make it better but with no success. The search system also doesn't seem to have the best searching algorithm, this I can see when I am trying to find some pages or documents using the title of it, but the search doesn't return it to me. This is a good solution for non-instant communication between people and teams, also to get announcements from the management. The relevant announcements from the management and other areas, such as people services are shared with the whole company here, and it is to be up-to-date with this. Also a good solution for integration between people. "Salesforce Chatter rises to the occasion "
I love that Chatter allows you to post questions and even tag people/ co-workers in the posting. It is similar to Facebook but for work and documents. I enjoy that in my casino industry we can post different tools, documents, contacts, files, and cases. The interface has different groups to choose from, people, opportunities, and even breaks down topics and activities in the sidebar which is helpful for navigation. The Chatter tool can definitely use a facelift in design for a better user interface that looks better and has a little more organization. Chatter notifications can crowd your inbox, so users just keep that in mind. The chatter feed gets busy sometimes and can be hectic when trying to find something specifically. Within the casino and hospitality industry it is helpful to share documents over several businesses and know what promotions are going on. This Chatter tool is great for keeping communication open over a large user-database. "Chatter Can Be an Efficient and Fun Way to Share Productivity Data on Salesforce"
Chatter is tool within Salesforce that enables team-members to share data quickly and efficiently through a social-media like platform. The tool helps create a collaborative and conversational type nature to business file communication. Overall, the tool works very well for that purpose. The platform does not feel as if it is entirely fleshed out as of yet. I also think an individual's feed can get bogged down by non-essential conversations. Chatter can be a really great tool for fostering productive conversations amongst colleagues. There are some circumstances where the tool could be used overly as a social network tool. We utilize chatter in order to converse with departments outside our own throughout the company. We typically use chatter in order to request / send information to specific individuals or teams. "Shared collaborative space for SFDC integrated enterprises"
For business with processes heavily integrated with Salesforce.com, Chatter is an excellent way to collaborate. Chatter provides a bulletin board & conversation space where employees and groups can share and discuss topics whether or not they are related to specific tasks happening in Salesforce. Users can discuss ongoing cases, opoortunities, etc. going on in their Salesforce instance and share files. At times, finding the groups you want to connect with and the specific content you're looking for within Chatter can be less than intuitive. But, it always serves the purpose and has been helpful for discussion & collaboration within our team. Creating function-specific groups for SFDC-integrated processes as well as broader organizational groups. Sharing files and documents, linking to SFDC cases. Tagging colleagues with questions or other highlights. "Great communication and collaboration tool"
The main problem it resolves is having to go to multiple sources to find out what has gone on with a record, it is all in the chatter feed. It also allows a group of people in a similar role to communicate and provide assistance to others. If you run into a problem with a client and aren't sure how to handle it, you can post it in a group and anyone in that group has had the same issue can tell you how to best handle it. "SF Chatter for the WIN"
Accountability, tagging, tracking tasks, events, and notes from my sales team. Utilizing Chatter keeps my team out of email and in Salesforce, 'forcing' them to respond and apply updates in the CRM. This keeps everyone up-too-date and has increased collaboration. The email notification can be a bit overwhelming (depending on the adoption and use of your team) - simple email rule has routed these to a folder. If you are looking to alleviate email updates and exchanges on business, sales, or opportunities, you need to consider Chatter. Accountability and getting data and updates from sales into the CRM. Chatter, once adopted, is powerful and effective as a way to empower your sales organization of any size. "It is a fun and easy way to communicate between colleagues"
I like that it acts like a bulletin board where everyone can post their questions, feedbacks, comments, and everything else so other people in the team or company can see and respond or like. It's also a place where new hires can introduce themselves and get to know everybody. I can find people in the company, message them, tag them in posts, and see posts that I was tagged in. It's not really a dislike, but I think it can use a nicer, more sleek interface. Right now the interface works, but it looks quite dated and not too aesthetically pleasing. Also would be nice if there's a gif feature like with Slack. Chatter is a good feature in Salesforce that makes communication between everyone in the company easier and more interactive, especially if it's a big company or a company that has mostly remote employees who don't get to spend time physically with each other everyday. It is simple, straightforward, kind of like an earlier/simpler version of Facebook. It is not the most pretty or best looking communication software out there, but it does its job and it is integrated with Salesforce so that's a big plus if you're already using Salesforce. I think it just helps with communication within the company in general. Anything that has to do with communication can get benefits from Salesforce Chatter, like employees asking each other questions, sharing feedbacks or new information, or just general greeting and socializing. "Easy tool for team/business communication"
I like how simple to it is to post onto Chatter. I additionally like that your association can have a wide range of babble bunches that you can pursue. I can bookmark or quiet certain strings. You can likewise take a survey inside a string just as transfer a wide range of records. I discover Chatter a decent device for speaking with individuals both in my neighborhood office, just as individuals who are in different regions the nation over. Its very client friendly.I like how regardless of if my associates are in office or telecommuting we can even now all ricochet thoughts off each other utilizing this product. I don't like that you can't control where connections posted by means of gab are put away. They are naturally presented on the record where the prattle exists and here and there, you don't need clients adding connections to a specific record. I think Chatter is an extraordinary asset for both coordinated effort and spirit. We use it often here to share thoughts, examine openings, and commend victories. We even have one group that posts birthday wishes and keen "Day by day Doses of Awesome" which are amusing to see. It's an extraordinary bit of Salesforce all in all. Make sure to label everybody in each answer, unique post, and so on else it won't consequently input names and label staff! It's an extraordinary device. Look at it! Coordinated effort is unquestionably occurring with Chatter. We are experiencing some re-association and a portion of our colleagues are hoping to migrate. We've utilized Chatter to help facilitate the change by giving data about our neighborhood networks, schools, and lodging with those that will think about the move. Likewise, we have Chatter bunches that are for the sake of entertainment - like one for devotees of The Walking Dead. It's a fun easily overlooked detail to impart to associates over all divisions that I may not generally cooperate with. Group Collaboration, Dev to User Collaboration. With Chatter, I could work together with Users, Team Lead and Project Management on a pleasant and helpful way. Chatter es una aplicación de comunicación empresarial o como un tipo de red social empresarial mediante la cual los usuarios de una empresa puede enviarse mensajes en la sala de chat, realizar llamadas y video llamadas. Permite realizar encuentas sobre cualquier tema, los grupos proporcionan debate sobre los temas de interés entre los usuarios de la organización. Es compatible con IOS y Android. Posee páginas de temas que poseen publicaciones y respuestas relevantes, asi como sugieren grupos, expertos, archivos y otros recursos relacionados con el tema de interés. Posee un intercambio seguro de archivos en tiempo real , lo cual nos permite mantenernos informados. Permite a los empleados y mis compañeros encontrar ciertas respuestas que necesitamos sobre alguna información. Su diseño exclusivo en smartphone mejora su interacción y su interfaz al momento de ejecutar esta aplicación. Lo que no me gusta de Chatter es su sistema de soporte, el tiempo prolongado con el que resuelven un requerimiento y que su soporte solo sea en español. Además el que no este disponible en ordenadores me parece negativo y es algo que Salesforce debe aprovechar más. Su sistema de video llamadas no es mi favorito. Chatter es una buena aplicaciòn de comunicación y chats empresarial muy util y recomendable. Su precio es bajo y, aunque tiene cosas que mejorar su interfaz en smartphones es excelente. Con chatter hemos podido integrar a los colaboradores y gerentes de la empresa en una sola aplicación, asi como mejorar el desempeño y entrega de documentos y archivos por medio de Chatter. Comunicarnos y dirigir proyectos de interés mediante esta aplicación, estar al tanto en todo momento sobre las noticias y notificaciones de la empresa. "Chatter. The business social network"
What I like most about Chatter is its original business chat service that distinguishes it from other applications and allows all collaborators of the organization to be interconnected through its chat system. It allows you to share files and documents in a totally safe way through SalesForce, develops calls, video calls and video conferecias of quality. It keeps all workers, managers and collaborators aware of the news of the environment. Its mobile application will give the user the maximum experience through its excellent interface. There is little that I dislike about chatter, but I would like you to be able to transfer the excellent interface of your mobile application to the computer and improve its support system that is only in English. Through Chatter, the organization has been able to implement with its collaborators a chat platform that complies with all its security standards, increasing the performance and communication of workers and collaborators at the lowest cost. Salesforce gives the organization full confidence in its security system. Communication and teamwork had never been so efficient. Chatter is an exclusive mobile application and works as a social business network that allows you to develop an internal business chat system. Chatter manages to securely exchange documents and files through social networks with the Salesforce Files service. It allows you to synchronize files securely with any mobile file, in addition to providing a complete and powerful experience on such devices, in addition also performs custom actions from mobile devices to drive progress from anywhere. Data and records are directly connected to your internal systems to maximize efficiency and eliminate errors. It has multiple languages to suit the user. It keeps the employees of the organization updated by updating the daily news that is most used in the geographical area. If your organization wants a private and secure chat system, acquire Chatter with complete confidence. It will allow them to keep the workers of the organization interconnected without any inconvenience and with the highest security standards. Chatter has allowed the organization to keep all its collaborators in a single chat platform, improving internal communications, developing the processes in a better way, reducing their costs in increasing efficiency. The Salesforce system gives total confidence to send and share private, sensitive and confidential information without any mishap. Keeps employees up to date with information, which is good for evaluating the business environment, developing strategies in this regard. "My experience about Chatter. 9/10"
In my opinion, the characteristics, tools and qualities that I like about the Chatter application, and for which I have decided to make this post and comment on it at a professional level, are, in principle, able to put the members of the organization in contact with each other. to work as a team and get in touch at any time and place, developing and communicating more efficiently the tasks and responsibilities at work. This application allows the user to create a chat table, help, update a sales opportunity, approve expenditure budgets or funds for the development of projects, all from the convenience of a single application. The information and data in the registers are directly connected to your internal systems. Despite the high rating that I have given to this application, it has certain shortcomings, such as its availability only on mobile devices and can not be used on computers, avoiding the efficient use of the full potential of this application on the computer. The weight of the application is very high, so if you do not have a high capacity device, you may not work with all your available potential. I recommend the organizations that obtain Chatter, and thus they will be able to improve the quality of the communications in their organization, their efficiency and the time of the development. The solutions and improvements that Chatter has achieved in the organization are many, but outstanding decrease in costs and losses due to failures in communication systems, since with this application all the administrative members of the company can communicate and develop in a better way their functions, as well as evaluate your opinion on the application. It is taken into account to a greater extent how they feel in the organization or if they do not agree with any specific measure, communicating it immediately. In addition, through the creation of groups, all members of the organization can become familiar with the issues, regulations and notifications instantly. In my opinion, Chatter is an application that allows you to increase and improve the productivity of companies, since it manages to get in touch with the members of the organization so that they work as a team and can develop in a more timely, effective and efficient way their tasks. and labors. It allows the user to create a help desk case, update the sales opportunity, approve spending budgets or funds for the development of projects, all from the community. In addition, the information and data of the registers are connected to their internal systems, maximizing efficiency and reducing errors. I recommend organizations and users to acquire Chatter. Create chat groups with topics from some disciplines through Chatter to encourage the habit of using chatter communication in related records instead of sending them via email whenever possible. Through this application the organization has managed to keep updates on the cases of customers and problems in their systems in an organized manner, and with the possibility that all members of the administrative and technical staff of the organization can receive the information and attach it in a timely manner. It's extraordinary to put everything in one region, but you would recognize a better framework and I can see that Chatter is working on that and it's getting better with each revision. This is an application that allows to increase and improve the productivity of companies, since it manages to put in contact the members of the organization so that they work as a team and get in touch through the various organizational boundaries. This application allows the user to create a help desk case, update a sales opportunity, approve spending budgets or funds for project development, all from the community. The information and data of the registers are directly connected with their internal systems, maximizing efficiency and reducing errors. There is little negative that I can say about this application because of how excellent I think, but the bad thing is that it is only available for mobile devices and can not be used in computers, so it can not exploit its full potential in any device . The weight of the application is very high so if you do not have a high capacity device, you may not work with all your available potential. If you do not want the members of your company to be distracted by social networks during working hours, but you want them to be connected with each other, and have the opportunity to develop activities and even improve the quality of presentation and time of the development of these activities, this is the application you are looking for. "Chatter is good in theory, but not a practical solution for enterprise collaboration"
It's appropriately named. Chatter gets filled up with a lot of rapid and useless posts about trivial matters. The useful posts made by administrators and IT get buried in the chatter, so they end up becoming trivial and useless too because it's hard to see them amid all the trivial chatter. Salesforce likes to say that Chatter is a forum for sharing insights and ideas but it is not. A forum would be organized topically and searchable; Chatter is not organized and not searchable at all. Peers sometimes propose great ideas or ask questions but they get buried by the newest posts. Currently I can organize my Chatter feeds by What I Follow, To Me, Bookmarked, Muted, and All Company. These options aren't very helpful. There's an option to search Topics but this is only useful if the original poster included the Topic as a tag; most people don't. In order for Chatter to be even slightly useful, it's needs the option of searching by a keyword and pulling up all posts that have that keyword. I have better luck problem-solving by doing a Google search. I also have much better success collaborating with my peers by using email, walking to someone's office, or picking up the phone and making a call. I would never rely on Chatter for any important or timely communication. The Files and Groups options in Chatter are also useless because most people don't use them, again because it's not intuitive and because searching inside of Files or Groups doesn't pull up results unless the original poster put the relevant post in the Files or Groups section. I would not recommend Chatter at all. There are much better communication and collaboration tools available. I haven't solved any problems with Chatter or enjoyed any of the advertised benefits. If anything, it's created more headache because it's one more communication channel I have to check but it doesn't make it any easier to do my job. The ease of being able to communicate with other employees that may live on the other side of the country as well as keep our upper management informed of our days and what we are doing. Salesforce Chatter is a big part of our days here at this company. It's super easy to use and you have the ability to post files that can be shared with the entire company or you can post in a private group. Either way, it's a great product! It has some bugs and likes to sometimes double post or not post at all as well as having to refresh the screen multiple times and it doubling everything that was completed before. But even though there may be some bugs, they always get fixed and we can move onto working through our day. This is a great product if you have many employees that may be hard to keep track of. Being able to exchange ideas with colleagues across the country. The higher up management have more access then myself as a Financial Service Rep.
"Salesforce Chatter - Collaboration all the way!!!" "Simple and Easy to Use Social Newsfeed within the Workplace"
I like that Chatter is very simple to use and navigate around. It acts just like a social media newsfeed homepage, but with your coworkers within the workplace. It is a good way to make office or company-wide announcements as well as keeping employees up-to-date with upcoming events or meetings. There is nothing to dislike about this software really. It is just a basic software that ties in social networking within the workplace. If you want a great communication system within the workplace besides regular back and forth email, consider Chatter! This software is easy for anyone to use and brings some fun into the office! Chatter is a great way to make announcements or just to simply talk about or share milestones with fellow coworkers. It is beneficial to employees as it provides a fun environment for everyone to interact with each other through a live newsfeed page. I love that the interface was literally just like facebook.. which is easy to navigate and fun. I also liked how it was integrated into salesforce... which is what eveyrone in the company already uses... was one less thing to have to open in order to communicate with anyone in the company. Get people trained on how to use it appropriately within a work atmosphere. some people were using it like they were on a personal social media account. we are using it with training classes... post class we create a group of the participant and then they are able to talk about how they are using the skills they learned in class. I like the fact that it's very similar to a Facebook platform which almost everyone is familiar with so there was no need to adjust or learn a new platform. I am not particularly fond of the information we can post. If we are to post photos, we would have to attach it as a file that other users will have to download before we can see unlike in Facebook that you can immediately view the photo from the post without having to download or add any extra clicks. I also don't like the fact that for us to get notified of new comments on a post, team members would have to "like" a post. "Like" all posts for you to get a notification of all comments to an existing post. Chatter provides the convenient communication across teams and team members that Facebook achieves in their platform. Because it's separate from Facebook (as opposed to making a Facebook group for the team), there are no distractions and information is secure. At the same time, information is disseminated as quickly and as efficiently. "More than a social network"
If leveraged properly, can actually give tangible benefits to efficiency and can actually drive sales. The lightning version of the tool is obviously the best. Being split over Lightning and Classic. This won't apply to new adopters of Salesforce however, so I wouldn't expect this to impact on any buying decision. Honestly, make sure you do not mix it and fragment it with other software. If your company is attempting to gel it with Yammer or any other software, just ditch that other software. You need to have all your users focused on using the single tool to reduce complication, but also to get them used to going to it as a first point of contact. They need to be used to collaborating on it, then working on business objects with it. Actually using it to automate processes - it is sending esignature documents, bad data tickets, adding in client sites. The main gains on this are far beyond the usual collaborative aspects of social network software. A communication tool accessible without ever leaving your CRM platform. It's a great way to keep abreast of trending topics internally, and learning from other people's questions that you didn't know you needed the answer to. Much like the Salesforce interface, Chatter seems a bit clunky and engineer-driven rather than keeping the end-user in mind. Sales management uses the tool daily, but when asking peers if they use it, everyone tends to say they ignore the platform unless specifically tagged. It's just too overwhelming with the layout it has now, and not entirely intuitive. Internal sales communications and Q&A is all kept in one place that is viewable by everyone, rather than needing to sort through email chains or having a separate platform. "An easy way to communicate with your team"
Chatter allows our team to communicate with each other on many different projects. It effectively logs our communication and actions taken, and allows you to tag important members of your team to notify them of updates. Also, you can include notes just for yourself, so if I have many projects, I can easily read past notes that I've left for myself regarding the project or account on chatter. We use chatter notes on different projects, such as those created by TaskRay or in a Salesforce account; it would be good to have a way to consolidate all notes across all projects in a single, easy to read place. Use this in tandem with your other Salesforce tools to make tracking projects much easier across team members. You can also use this as an effective note taking tool for yourself on your own projects! Often with many members on a team working with the same account, it could be easy to let details slip between the interactions our team members have with our clients. Chatter allows us to communicate more effectively with each other, work much better as a team, which in turn is a much better experience for all of our clients. Through chatter we can leave notes to each other so when another team member comes in to interact with the client, they can get more detailed notes from Chatter than those that may have been left from any tasks/calls logged in Salesforce. Also, you can log notes and information on an account without having to log a call or an actual action that took place. "Chatter Helps Organize Project/Client Related Chats & Comments!" I like that Chatter allows you to directly tag colleagues/teammates within a specific project to keep project-related chats and comments organized and in the appropriate place. I dislike that you have to put the @ symbol in every time you want to tag someone and also that you can't just tag their first name (like you can when you tag someone on FB). Chatter is a great way to keep conversations within your projects or clients organized and archived. We discuss campaign-related issues or needs via chatter and use it as a way to loop in the appropriate team members on a project when we're looking to solve a problem or update the team on something. "Decent for cross-department communication in a large organization." I appreciate that I can interact in a community forum across our large organization. Chatter is fairly convenient and reliable. It's a good fit for an organization that values employee feedback and autonomy. It has basic forum-style features - nothing fancy, but stable and usable. The visual design is certainly not cool or modern. If we're comparing with any popular social media platform, this user interface looks like it just stepped out of 2007. Search functionality is also clunky. My biggest complaint is that it's difficult to find and join relevant groups. There is no good directory function to search for groups that would meet certain criteria. If the organization has few groups, this isn't an issue, but in an organization with lots of initiatives and several groups related to each, finding and managing groups is a clear weakness of this platform. Investigate before implementation: would a different communication platform like Slack work better for your organization? Chatter seems easier for less techy teams. Slack and other similar products might be better for startups. Our Chatter implementation primarily provides a "think tank" type of space for employees. It's not a channel for official communication, but it's usually project- or role-focused chat. There's a lot of brainstorming and idea sharing. Some of this brainstorming has been implemented. I think, as with any tool of this type, the ideas generated must reach people who can implement them. Chatter doesn't guarantee this, but it depends on the organization's implementation. The only thing I dislike is the fact that the communication is not quite real-time but other than that, I really enjoy chatter and find it very useful. It's a great tool. Check it out! Chatter is a great tool that helps with collaboration within our business users. I used it the most to add all relevant project information and documentation to my different projects. It makes it very convenient and easy to find all relevant information in one central location instead of having to go to multiple places. "Best Social CRM tool "
- Gets the power of social media to your CRM system. - Makes CRM more interesting. Nothing - I basically have not found a thing that makes chatter not interesting. I think chatter is SFDC's answer to the social enterprise. The product has evolved from the time it was first launched. For some industries enabling chatter can cause some compliance issues like information you can and cannot share within the company. Careful analysis of what can and cannot be shared is required before enabling this feature. - Sharing records - Opportunities, Leads, Contacts, Information. - A unified CRM and Social platform. "Convenient and easy to use!" Salesforce Chatter is very easy to use - I especially like that you can tag staff members from companies outside of your own (not sure if this applies to other companies outside of Girl Scouts since we have different councils) I also really enjoy the chatter desktop app you can download, but the web platform works just fine as well. The only thing that I can think of is when you are responding to a comment thread, you have to remember to @ the person you are replying to and include any other names as it will not automatically respond to the original poster. Remember to tag everyone in every reply, original post, etc. otherwise it will not automatically input names and tag staff! Inter-departmental communication, as well as communication across councils and the country. It is very easy to use and connect with other Girl Scout staff members through chattter. I find this tool really great for collaboration across the enterprise with social feed type approach and contextual references. Either using it within the context of Salesforce Sales Cloud, Service Cloud, etc. or just as a standalone collaboration tool is an extreme added value for any company. Through proper settings, the necessary access rules for data could be leveraged in order to respect the internal policies. Perhaps the more challenging could be to find the specific information you are looking for. If you are a Salesforce user or if your company has acquired it, global roll-out of Chatter is definitely a must to promote collaboration across! I like that chatter allows us to create groups based on interests, specialties, departments, etc. and easily add descriptions, files, etc. for collaboration. I also like the ability to mute discussions, use hashtags/topics to track conversations, and even bookmark posts to come back to later. There's not much to dislike, really. Although I did hear that the desktop version of Chatter was going away, and that is disappointing. It was nice to keep up with what was being posted in the groups I'm in without having to actually log in to the full Salesforce page to see it. If you're already using Salesforce for your business, I think Chatter is a great resource for both collaboration and morale. We use it frequently here to share ideas, discuss opportunities, and celebrate successes. We even have one team that posts birthday wishes and insightful "Daily Doses of Awesome" which are fun to see. It's a great piece of Salesforce as a whole. Collaboration is definitely happening with Chatter. We are going through some re-organization and some of our team members are looking to relocate. We've used Chatter to help ease the transition by providing information about our local communities, schools, and housing with those that will be considering the move. In addition, we have Chatter groups that are for fun - like one for fans of The Walking Dead. It's a fun little thing to share with coworkers across all departments that I might not otherwise interact with. "The best way to collaborate on Salesforce records. Why would you use anything else?" Title says it, but why would you use anything else? It's simply the best thing to use for collaborating on Salesforce records of any type (and we use Salesforce for SO MANY things). One of my best work days was when we enabled Chatter on the custom object I own and manage. Now I can keep track of conversations on various records whereas before I'd have to dig through my email to see if I'd reminded someone about some action they were overdue on completing. My biggest complaint for most of my tenure using Chatter was lack of text formatting, but Salesforce has resolved that. The only other area I think could use improvement is reporting on Chatter. I'm a competent report builder, but the times I've tried reporting on Chatter I was not successful. I still intend to try a few other approaches. However, this could be the way my org has our report types setup, I'm unsure about that, so take this with a grain of salt and do your own research (because there's tons out there). We use chatter to communicate directly on a record within Salesforce, which makes the communication very topical and prompt, vs. copying links or record IDs into an email (which is what typically occurred before Chatter adoption). Having that conversation history directly on the record and seeing who was involved in the conversation is a huge benefit to the work that I do. 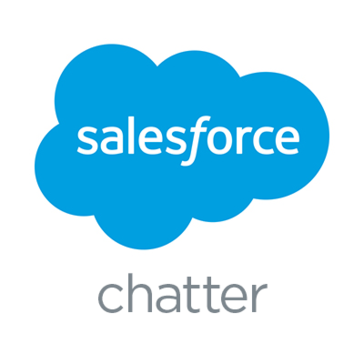 "Chatter - Great if your company uses Salesforce the way its meant to be used." What I really liked best about Chatter was that it was part of Salesforce which is where I spent about 95% of my day while working in account assignment for incoming leads. It was easy for me to link people, e-mails and activity to SF and get that information to anyone involved with that customer by using Chatter. I didn't dislike anything honestly. The most frustrating part part was trying to convince people to use what comes integrated with Salesforce and breaking them of their ways with other programs. The last time I used it the system was not as intuitive as I had wished for. The biggest thing it helped solve for me was communication. I was able to send information to sales people or reps within the system making it a bit easier for them to see things how I see things and viewing the information within the system makes it easier for them to manage it. "Salesforce Developer - Chatter to connect with users"
I like the Polls, Actions, Groups, and Topics. Also having the ability to at-mention other user is great. Having a social media thing inside your CRM to collaborate with anyone in your company is really great! There's nothing I really dislike about Chatter. I never experience looking for a functionality I need that is not there. For enhancement, I don't think of anything, maybe if Salesforce can think of new features to add, it'll be great. if you are using Salesforce and not using Chatter yet, I advised you to please use it....It'll drive more productivity and accelerate innovation in your business! and yeah of course, all cents worth! Team Collaboration, Dev to User Collaboration. With Chatter, I was able to collaborate with Users, Team Lead and Project Management on a nice and convenient way. I like how easy to it is to post onto Chatter. I also like that your organization can have many different chatter groups that you can follow. I can bookmark or mute certain threads. You can also take a poll within a thread as well as upload all kinds of files. Chatter is a great function within SalesForce and I highly recommend using the tool to communicate with internal staff. 50% of our staff are remote. Therefore, chatter really facilitates continuous discussion among team members no matter where they are. I find Chatter a good tool for communicating with people both in my local office, as well as people who are in other areas across the country. Its very user friendly. I think there should be a dislike button as well as a like button. I find that not everyone uses it so getting a hold of someone can be a challenge if they're not regularly signing on. "Excellent for inter office editing of projects." I like how no matter if my coworkers are in office or working from home we can still all bounce ideas off one another using this software. Just the sign in, the changing of passwords every so often drove me a bit crazy. Excellent communication tool for getting your business headed in the right direction. The ease of sharing key updates/responses with my colleagues. I often get direct feedback from clients, and I like sharing their appreciation (whether it's thanks for a quick response, or something more detailed) with the account manager, sales exec, project manager, etc. I'm not always sure what level to put my updates on - whether I should do it at the invoice, contract, case, or account levels. Determine up front where you'd like certain updates to go. Provide some direction to each end user. Effusive thanks versus critical feedback for future product developments - the two shouldn't necessarily go in the same spot. We use Chatter to increase visibility and communications internally. It's a great opportunity to share compliments or feedback from clients and tie it to a specific event, rather than potentially have it lost in the shuffle. Chatter is a great feature in SFDC for collaboration for quick updates on records as well as a historical record on what happened and when. Whether it be a simple question or to announce an achievement to the larger org, its a great tool to make it happen. It's part of your salesforce.com package. Use it. Team collaboration is number one. If chatter eliminates 10 emails a day, its a good thing. By making the right discussions a little more public within the company, it helps keep the audience at large motivated to a common goal. "Needs a LOT of work"
SSO available, and it integrates nicely with the salesforce app. The app is horrible, though, and so that part is useless. The clunky interface is hard to find your way around in on the website as well, and the groups are not easy to tell if you are inside of them or in another group. I just do not think it's the best chat collaboration tool out there. Slack is much lighter and better for chatting. As for posting items to your colleagues, Chatter does shine in this area. Seems this product is an afterthought for salesforce. I just do not see useful features, and it's difficult for new users to adapt to it. They end up replying using private messages, and lots of other chat features are just plain hard to find, and so go unused. Needs a lot of work, so unless you already have Salesforce or are using them for other apps, don't just go for Chatter. Slack is free and much better for chatting. Can't say there are truly benefits. We can accomplish the things we use Chatter for on many other platforms, most of them even free of charge. This app needs major work to be competitive, and frankly, to remain useful in today's collaborative market. Our team works virtually and has over 200 team members across the country. With Chatter we can quickly call attention to accounts, ask questions, and draw attention to data points and follow ups. Sometimes it's difficult to see where exactly the questions are without images or pictures of components. This feature is not available in Salesforce Classic. We also have ~200 limited access users who are not able to see Chatter posts from full users. Glad to see that images and component snapshots are available in Lightning. We are a virtual team and Chatter allows us to connect quickly inside out database. It also allows our analytics team to ask questions and make updates in a timely manner. "It's a good option for bigger companies"
I love the fact I am able to post a message or photo with my entire company. Gives us freedom of speech and expression. No real business problems have occurred with Chatter so far. With Chatter, I am benefited from being able to use my voice and express my opinions. I’ve also used it to share vaulable information with my colleagues. It’s great and easy ability to putting my name out there. I think one feature that I do like is all open chat channels stay within the same box. The UX is definitely not the best and could be improved. There also seems to be a lot of sync issues, I'm constantly logged off or am switched to "offline". When a new chat is presented it is fairly disruptive by bringing it immediately to the top and in focus. It can be pretty bothersome if you're typing something. I would look around for other options first. I've also heard that this product will be discontinued this year. We alternatively also use Google Hangouts. It's not really solving any business problems other than it being an internal communication tool. Not too many benefits other than seeing Salesforce activity within the platform. One benefit is that it is integrated with Salesforce and the records are kept there for posterity. I like that you can post updates and also store information for clients in the same application. I also like that you can have pop up notifications when someone posts something new to alert you while you are doing other tasks at work. Nothing in particular - would be nice if this application worked on older software versions of android cell phones because currently the Chatter app is not compatible with my phone/software version. It is a great product if you want to share with employees updates and information in a form that is familiar like social media to people. I also like the feature that you can turn on or off where you can have pop up notifications of new items that people post. We use this to get updates about weather conditions (in the winter) or general company updates to everyone. We also use this to see when a new job was sold or a new client has accepted a bid for our company. "Chatter by Salesforce.com helps Sales Support stay informed"
Sometimes the information is not in the place you would expect or when searching for a particular customer's information it requires multiple clicks to reach the desired section. 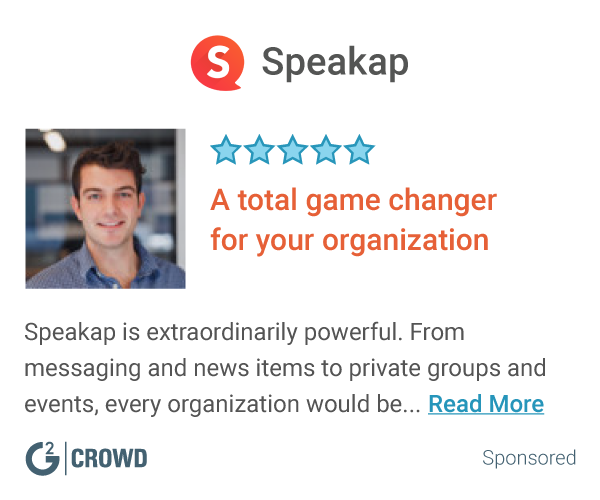 I would suggest that the company seriously consider adding Chatter to their tool list, but perform the appropriate research into any potential alternatives if not already using Salesforce in one capacity. By accessing Chatter for our Sales Support team, it has helped several departments communicate with each other in one place to add escalation issues, attach documents and share other updates about a particular customer or potential customer through installation. Allows sharing information within team members working together. Employees can share information and updates via chatter about Opportunities, Customers. Contacts or any other business objects. This leads to improved communication between co-workers. Key here is adaption. If a culture can be developed where employees share regular updates, then Chatter is a great tool. At some organizations this is not feasible, so Chatter is not useful for such organizations. You should plan to use Chatter as part of other Salesforce product suite. It is included in other standard Saleforce product offerings like Sales Cloud, Service Cloud etc. It is not sold as a stand alone product. The best feature is the collaboration feature. You can follow/join all your groups in easy to view GUI. I think having to login to the website to view content at times can be a bit cumbersome. I'd like to be able to view it all from the desktop app. Recently we rolled out a new program and SF Chatter was instrumental with connecting people when they had issues. The ability to ask questions and post comments has solved numerous issues from that first point of contact. Good centralize tool to understand and be aware of any sales opp update. Good social media type messaging solution. Gives update on daily basis. Solves the purpose but could be better. Yes. The tool solves the purpose of communicating updates, keep all involved appraised on the progress. Meeting the revenue goals by eliminating any issues that requires immediate action or escalation. It keeps leadership aware on the progress. * We monitor all Chatter reviews to prevent fraudulent reviews and keep review quality high. We do not post reviews by company employees or direct competitors. Validated reviews require the user to submit a screenshot of the product containing their user ID, in order to verify a user is an actual user of the product. Hi there! Are you looking to implement a solution like Chatter?